Does Rice Have a Lot of Protein? You will get some protein from rice, although you'll have to eat a lot of it to get close to your recommended daily intake. White rice is heavily processed and typically lower in protein than other varieties. Darker rice, like wild or brown rice, has up to 40 percent more protein than white rice, making it a better option for upping your protein intake. 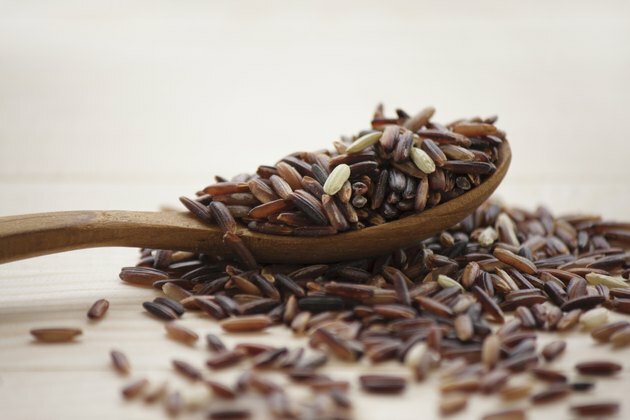 Wild rice tops the list of high-protein varieties of rice. Each 1-cup cooked serving offers over 6.5 grams of protein. Brown rice isn't too far behind, however. You'll get 4.5 to 5 grams of protein from a cup of prepared brown rice. White rice tends to have the least amount of protein. One cup of steamed white rice provides between 4 and 4.5 grams. Protein needs to make up anywhere from 10 percent to 35 percent of all the calories you consume, as stated in the publication "Dietary Guidelines for Americans, 2010." Having a 2,000-calorie diet, for instance, requires you to get 200 to 700 calories from protein. Divide calories by 4 -- protein has 4 calories per gram -- to determine the amount you need in grams. In the case of 2,000 calories daily, aim for 50 to 175 grams of protein. Having a 1-cup serving of rice gives you 2 percent to 13 percent of the protein you need on a 2,000-calorie diet, depending on the type you have. Practically every function in your body relies on protein. During digestive processes, your system deconstructs large, complex protein molecules, leaving smaller amino acids behind. These amino acids go on to build muscle tissue and organ tissue, support cell walls and power neurotransmitters for neurological functions. In some cases, like when glucose or fatty acids aren't readily available, your body can even burn protein for energy, although this is a last resort. Rice and most other plant-based foods are incomplete protein sources, meaning they don't have adequate amounts of all the essential amino acids. These are the amino acids you have to get from food, since your body cannot make them. Your digestive tract can break apart amino acids from different foods and pair them together. You just have to have several types of incomplete proteins in your diet throughout the day. So if you have rice with lunch, have a side of beans or lentils with dinner, or have nuts or a hummus dip as a snack. You'll be getting several different incomplete protein foods in your diet to help your body get all of the essential amino acids. Which Part of an Egg Has the Biggest Amount of Protein? How Much Protein Is in Grilled Salmon? Is It Healthy to Eat Beans and Rice All the Time?